On top of the Sony Xperia Z3, U Mobile also added another device to its phone bundles – the Huawei Honor 6. 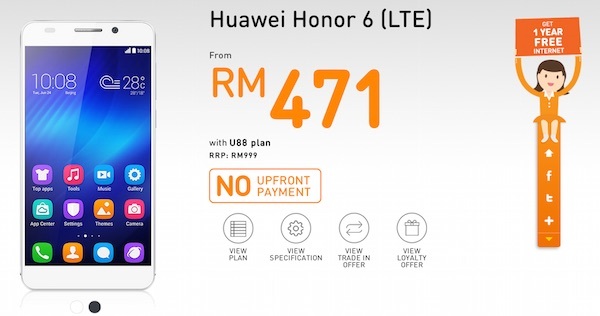 Launched in Malaysia in mid-October, the device retails at RM999 but if you sign up for a contract with U Mobile, you can get it from as low as RM471. As with all bundles from U Mobile, the deal will tie you up for a 24 months contract under one of its postpaid plans – U58 or U88. 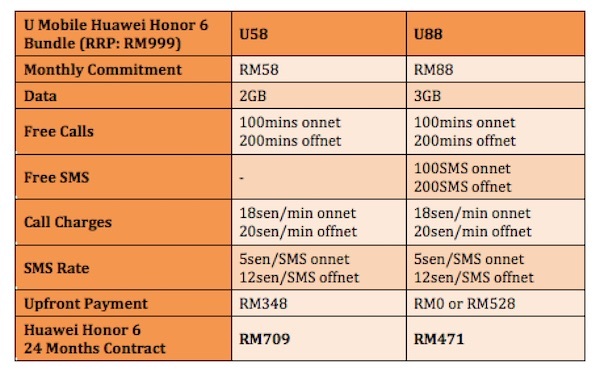 Both plans comes complete with data, free calls and SMS, and if you sign up for the more expensive option, U Mobile might even waive the upfront payment. Zero upfront payment promotion is valid only for U88 plans. Just purchase the phone via credit card and subscribe to auto debit for monthly access fee. Non-eligible customers will have to pay RM528 (RM88 x 6 months). Like the Sony Xperia Z3 bundle from U Mobile, the Honor 6 is also eligible for trade-in offer and loyalty offer. Trade in your old phone and get up to RM750 in rebates for the phone, or if you have been with the telco for over 6 months with an average of at least RM50 monthly bill, you can get additional loyalty rebates of up to RM400. Visit U Mobile to find out more about their trade-in offer and loyalty offer. Visit U Mobile for more information about their Huawei Honor 6 bundle, or check out our review to find out more about the device.